If you visit any national bookseller, be it online or a traditional brick and mortar store, you are bound to find numerous books on the subject of candle making. Each book may offer you a unique perspective and may focus on a specific type of candle making. For example, you may find three different books on candle making – one features container candles, one features molded candles and yet another features specialty gel candles. You can also find candle making books elsewhere. Many arts and craft stores are carrying books on candle making these days. Moreover, it is possible that you will find what you need at your local library. When choosing a book, make sure that it covers the type of candle you are most interested in making. Pictures can be extremely helpful so look for one that shows many examples. In addition, make sure that your book contains a section on safety. Candle making can be a dangerous business if not done correctly and everyone needs to be well informed. Another great candle making resource are online retailers that specialize in selling candle making supplies. You can learn a great deal by simply reading about the products they have to offer. These online retailers are also your best bet for purchasing your supplies. They offer the highest quality merchandise and almost never require minimum orders, making it easy for small, budding candle makers to purchase their start-up materials. While many arts and craft stores have begun carrying candle making supplies, their selection is often extremely limited and their quality is usually inferior to the products available through true candle making suppliers. Easily, the best resource for learning to make top quality candles is experienced candle makers themselves. You will save yourself countless hours and money by learning from their mistakes. Their experience is priceless. They can advise you on how to avoid mistakes that you would otherwise learn from trial and error. While most experienced candle makers will have certain information they may not be willing to share, you will be surprised at how open most are and how willing they are to give advice. If you do not know any experienced candle makers personally, there are several great forums available online where candle makers ask questions, share experiences and exchange information. Using these boards will help you immensely. 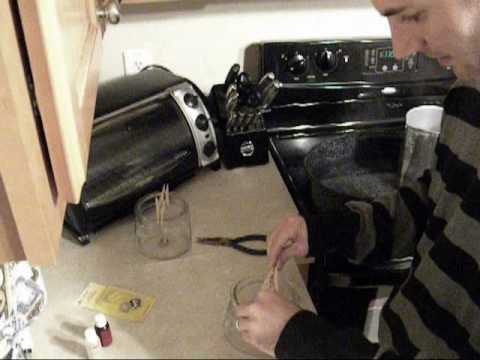 While the art of candle making may be a complex art to master, it is a worthwhile endeavor that will offer you countless hours of fun and fascination which you can turn into a fully fledged work at home business. When you consider that many Americans spend a substantial amount of money purchasing high quality candles, you could well find that your home candle making business is a very lucrative venture.